The coin collecting supply industry, just like coin collecting itself, is certainly a diverse and multifaceted endeavor, and encompasses a bewildering array of coin storage, coin protection, coin preservation, coin display, and coin maintenance and cleaning products, and in every conceivable design, component, variety, shape and size. Whether your coin collecting requirements revolve around a small private collection, or you are a long time coin collecting enthusiast, there are coin supplies out there to suit every need, and every taste imaginable. From coin albums, holders, folders, cases, tubes, and boxes, to displays, books, and even coin collecting software, there is no coin collecting material, method or mechanism that has not been produced or made available to satisfy even the most discriminating or demanding coin collecting necessity, presentation, specification, or technique. Here are some of the major brands in the coin supply industry that have been serving the coin collecting world for generations. Coin Safe – These Square Coin Tubes are very high quality, archival safe, with a compact design that is strong and durable, with double locking seals and are easily stackable. Cornerstone – This company produces a beautiful National Park Quarters P&D Albums with 16 full color pages with 112 holes for a P and D example of each national park quarter to be issued between 2010 and 2021. The pages include informative facts about the national sites and parks protected by the federal government and historical data highlighting the significance of the national park quarter designs. These albums feature acid-free paper and lenses to safely protect coins; is filled with information and data that discuss the reverse designs; and includes a grading scale for beginning collectors. Dansco – These albums feature loose-leaf, removable hinged pages with acetate slides housed in a rich brown leatherette cover with windows showing both obverse and reverse, and has gold lettering and features historical information on inside covers. The company manufactures Cent Albums, Nickel Albums, Dime Albums, Quarter Albums, Half Dollar Albums, and Dollar Albums. Dansco Archival Quality Slipcases are available in six sizes. Dansco archival quality slipcases are made with Silver-Guard corrosion-inhibiting protection. The slip covers inhibit toning and will not change existing toning. Dansco uses military spec materials which permanently neutralize corrosive gases in the air that can cause toning and discoloring. Slipcases work with silver, gold, copper, nickel, iron coins, medallions, and bars. Guardhouse – These 2×2 plastic coin holders feature a snaplock design, allowing your coins to be securely enclosed in the holder. The Guardhouse plastic holders are very similar to Air Tites, but the Guardhouse 2x2s are square and not round. Black insert contains no vinyl and fits in standard 2×2 boxes. H. E. Harris – Harris Coin Folders offer valuable historical and cultural information about the coin denomination and feature crisp, full color photographs of classic coins. Practical and durable folders open flat to display an entire collection at once, then close back to book size for easy storage. Their products include Cent Folders, Nickel Folders, Dime Folders, Quarter Folders, Half Dollar Folders, and Dollar Folders. Harris Frosted Coin Cases feature a very stylish “frosted” border for a very attractive display. Each style comes with a die cut cardboard insert that is beautifully decorated and printed to enhance the beauty of your coin. These cases make great gifts or for just about any occasion. 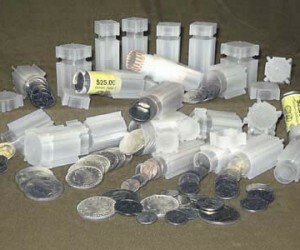 Numis – These coin tubes are very similar in appearance and design to the CoinSafe tubes above. The main difference is the Numis tubes have a single locking seal.